You experienced basic training. You know what it takes. And now, America needs your help. America looks to you as a leader in physical fitness and in life. You know how to push yourself and others. You’re a team player. You experienced basic training and know what it takes to get in shape. And that’s exactly why you’re needed. Now more than ever, people want to improve their fitness. 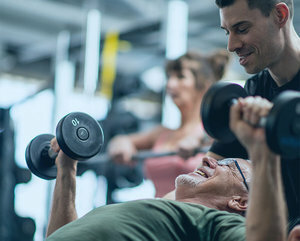 Americans are searching for their best option when it comes to a personal trainer, and you are the perfect fit for the job. Leverage your benefits, your experience, and your leadership to earn your Associate Degree in Exercise Science today. Better yourself while serving your country. 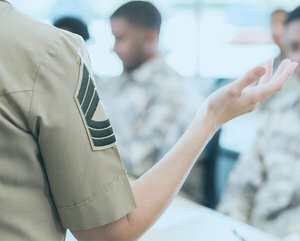 Getting your degree can benefit your future as an active duty soldier and help position you for a career after your service. Explore your military benefits. As a military servicemember or spouse, your tuition costs may be covered in part or in full. Complete the program while on active duty. Our online, flexible program lets you do your schooling on your terms. Explore the tuition assistance options offered to you as a military member. Get help utilizing your benefits and start your degree program today. Begin a new chapter in your career today. Explore the GI Bill education benefits and apply for the degree program. A perfect fit for your military lifestyle. Learn more about MyCAA, set up your account, and pick the courses you are interested in. Looking for a different type of financial aid help? Explore other aid options here.